With a large free breakfast manager's receptions and full kitchens in every room there's a whole lot to like about Residence Inn San Diego Central our guests assert. The two-story 144-unit hotel is suites-only which makes you feel at home from the git-go. There are fully equipped full kitchens for cooking your own meals but don't bother fixing breakfastâ? ?there's a free full breakfast every morning and our guests can't say enough about it. The rooms have work areas and pull-out sofas for a little extra sleep space. Working out is easy (well convenient anyway) with an on-site gym tennis court and pool. After that you deserve a nice long soak in the hot tub. There is an on-site laundry facility so pack light and save room for souvenirs. Other niceties: a snack shop weeknight manager's receptions and even a grocery-shopping service to help you stock that kitchen. And don't forget your four-legged pal: Pets are welcome here. 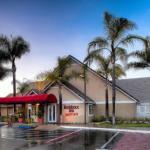 Residence Inn is located north of downtown San Diego neighboring the Marine Corps Air Station Miramar. It's an eight-mile drive to Balboa Park where San Diego keeps over a dozen museums including the Air and Space Museum and the San Diego Zoo. If marine life is more your thing it's only a 15-minute drive to SeaWorld. San Diego International Airport is 10 miles from the hotel; and it's just less than 10 miles to San Diego Convention Center. Parking on hotel property is free.